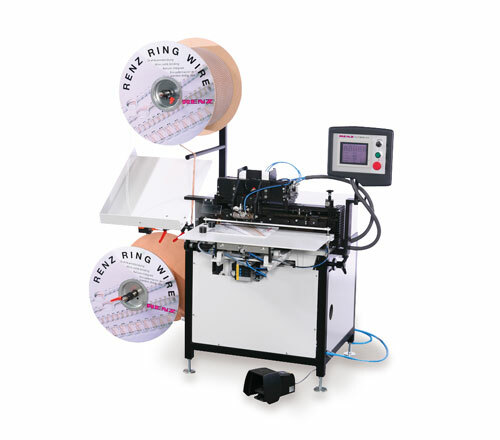 The RENZ® Autobind 500 is a semi-automatic binding machine for processing RENZ RING WIRE® from spools for books, calendars and skip-binding. By pressing the foot pedal the book is clamped and the binding table moves forward into the closing bars and the binding is closed. The KAS (calendar hanger tool) is required for producing calendars. Straight wire pieces are formed into the hanger shape and then automatically guided into the wire before closing. By this patented RENZ®-technology manual preparing and manual inserting of the calendar hanger is a thing of the past. The main control panel uses touch-screen technology. The screen clearly displays all current machine data, menus for adjustment and operation and – if necessary – error messages. Time required for diameter change: approx. 15 min. Format change without diameter change: approx. 1 min.